Myths of the World: Island of Forgotten Evil is rated 4.2 out of 5 by 9. Rated 5 out of 5 by EHinSF from Another hit game from this developer I had taken a break from playing HOPA games for 8 months and just came back and picked up a few new games and this one is a winner. Everything you'd expect from an EIPIX game, but it is a bit on the easy side, and story line is a bit predictable. I went with the SE because I typically don't need the Guide or bells and whistles. Rated 5 out of 5 by pennmom36 from Are You Next? So far, Myths of the World hasn't disappointed me. You can count on this series to bring their A game to the Big Fish ballpark to provide an interesting storyline and solid entertainment. 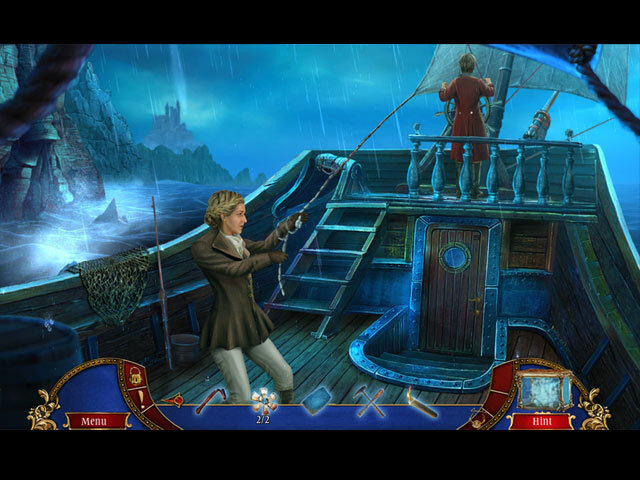 There have been some really bad games lately but Island of Forgotten Evil is not a forgettable game. I purchased the Collector's Edition immediately after playing the entire demo, but honestly, this Standard Edition is just as entertaining, unless you want the "extras" Hidden Signs. 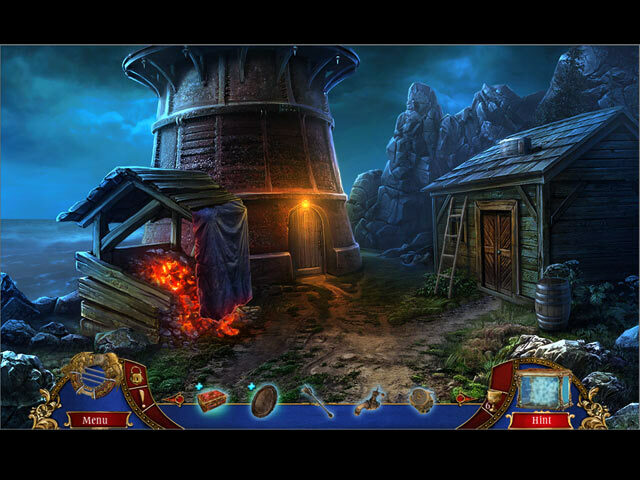 Achievements and Morphing Objects within the Hidden Object Scenes. Enough of my verbal opinions and on with the review :) When the Romans discovered an artifact that contained pure evil (seriously, Hannibal Lecter feared this entity) two brothers were chosen to restrain the evil within by separating the box and it's key for eternity. Vespasian, the keeper of the box and Sabinus the keeper of the key. One brother was successful, the other was murdered by his own men who were seeking wealth beyond imagination. Time eventually passed and the artifacts were all but forgotten, until Uncle Harry North's curiosity was piqued with the discovery of this ancient artifact, that had been passed down for generations. This curiosity led Uncle Harry to his grave, but, he has left encrypted clues in hopes that his last surviving niece can stop the curse he has initiated, and save the others who have been cursed, before it's too late! In my opinion this is one of the best Myths of the World games to date. Titus Flavius Sabinus served as legate in Britain under Aulus Plautius, governed Moesia for seven years as well as consul for another eleven years under Nero's reign. His brother Vespasian worked beside his brother in Britain, governed Africa and eventually Judaea. Although the brothers were an important part of history from about AD 45 TO AD 52, there is no mention of them finding nor guarding an evil artifact, but I think it's kind of cool how the devs were able to take actual Roman brothers and incorporate them into a thrilling adventure on an Island with the Forgotten Evil in the year 2016, AND make the story credible and believable to a certain extent. The Collector's Edition has all the bells and whistles you could ask for, not to mention fantastic graphics, plenty of Plus Sign Inventory Items to combine, and a really interesting plot. There are 42 very well blended Lyre's, or Apollo's Signs to find in each scene, Morphing Objects hidden in the Hidden Object Scenes and of course, Achievements to earn for achieving game related milestones such as solving a Mini Game quickly, or finding 8 objects within 8 seconds. The only "prop" you have in this game is the Valor's Light, which which reveals hidden caches and can protect you from the Romans who continue to guard in the afterlife, via Mini Games, of course. The Hidden Object Scenes aren't fantastic, but typical for this series. After playing thousands of HOPA's, I've come to realize that there's not a whole lot you can do to make a HOS exciting. Nevertheless, they aren't bad, but there's nothing proprietary about them either. There are scenes that you first find a berry of a specific type on a branch that will then move aside until you finally get to the real HOP, where you find ingredients and other items and use them back in the scene to whip up an alchemy recipe. Another scene requires you to find 5 of the same items in two groups that will then give you a tool to use to open up the interactive List finds. There are also Silhouetted Shape finds as well as Sketches of two items, tasking you to find the item related to the combination of both sketches. As I mentioned earlier, the CE has a Morphing Object to find in each HOS, and both offer an alternate game of "Skipping Stones" which is basically a Chain type Match 3 game where you click and drag a line that connects adjoining identical tiles. The Mini Game Puzzles are unique and quite entertaining. Below are brief descriptions of some of the games you'll encounter during the demo and a few memorable puzzles from the main game: 1) Valor's Light puzzle, tasking you to scan the scene in search of 4 symbols, using the lighted area to guide you right, left, up or down. 2) Help the caterpillar reach the bottom left corner by selecting and placing items from the board to overcome obstacles. 3) Complete the family tree by placing the portraits strategically, each portrait placed will will move the last previously placed portrait to the next place. 4) Complete the central shield symbol by selecting arrows to change the image on the cubes, selecting the correct image on the cube to place them in the center. 5) Move the gears to the position that matches their pattern. Gears cannot move diagonally and if they collide with a red token, you'll have to start over. 6) Swap and rotate the hexagon tiles to create an image, if the tile is placed correctly it will remain stationary. 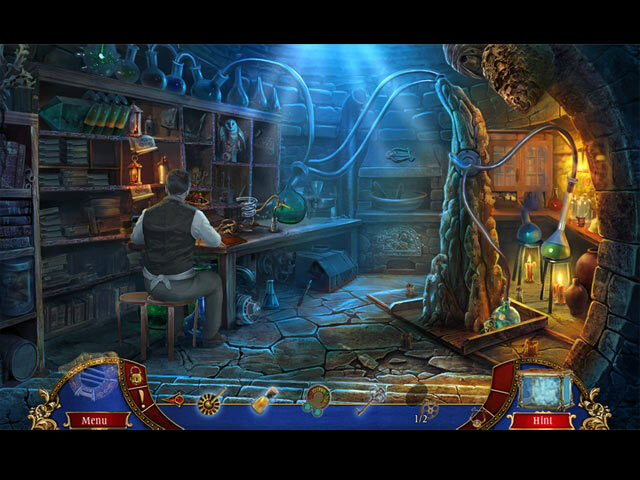 The Collector's Edition has 42 Hidden Apollo's Lyre Signs, a Souvenir Room, 12 Morphing Objects in the Hidden Object Scenes, 12 replayable Hidden Object Scenes, 24 replayable Puzzles, replayable Skipping Stones games, 13 Videos, 9 Music Soundtracks, 8 Wallpapers, 8 Concept Art pictures, 13 Achievements to earn, a built in Strategy Guide and a Bonus Chapter, enjoy! 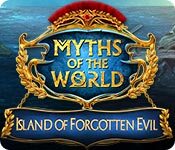 Rated 5 out of 5 by biscuitsmama from SOMETIMES ANCIENT TREASURE SHOULD BE LEFT HIDDEN Sometimes collecting or finding ancient artifacts can be very dangerous as you soon discover in the new Myths of the World – Island of Forgotten Evil. Your uncle was in possession of such an artifact and before you know it you are involved in intrigue and even something more deadly. Although the game has us again dealing with an evil entity (a theme that happens to be carved in stone here at BFG) I still happen to really like this game. I have found some of the puzzles a bit more difficult than those in some recent games and that is something I appreciate. The HOP scenes were excellent and varied with some being the multi-level type that this developer introduced to the genre. The graphics are excellent as are the voiceovers and various other sounds in the game. We have the standard modes of gameplay as well as a custom mode where you can fiddle with various settings when setting up the gameplay. Your tools include an interactive map and an amulet, a dreadful gimmick that I dislike. Now that the pet helper craze seems to have for the most part ended it has unfortunately been replaced by these gimmicks that seem to be in every game that is released. IMHO, they are nothing more than something thrown into a game to extend the game length and oftentimes I think they interfere with the game’s flow. Although the game theme is familiar, the storyline is very good and grabbed my attention once the game kicked into high-gear. As always it took a bit before the game moved along – after I escaped a burning house, and started following the clues left by my uncle. Yes, the game is what many might consider cookie-cutter but I happen to love most games from this developer who knows how to present a well told story and include the things I enjoy on HOPA games. Some might find the game easy but I enjoyed the level of challenge that was not too overly difficult but at the same time was not as easy to figure out as some games. I enjoyed the variety in the puzzles and that there seemed to be more of them than HOP scenes. I think the game has something for everyone and particularly gamers who might be new to the genre. For me the Island of Forgotten Evil is another great addition to the Myths of the World series and one I know will provide several hours of entertainment. As always, I recommend that you try the demo to see if this is a game you will enjoy. Rated 4 out of 5 by ninja226 from Good game--I approve You can play this game on hardest mode and still get Hint & Skip, which I like and wish more games did the same. Even on hardest mode, most puzzles were easy-manageable. The HOPs frequently had riddles instead of list of objects, which made them more challenging than usual. I was able to deduce what was needed to progress without resorting to hint, except for a few times. The story did not really grab me, but it is told well. I had fun playing this game and would recommend it to all. Rated 4 out of 5 by denniann2 from another great game in the series custom level and a great hint system. it is about opening pandora's box and the evil it can let out into the world. the HO scenes are not all the list kind but also the kind that has two pictures that you need to figure out what the end item is. this is the reason for not giving the game 5 stars. i dont' like those. sequel...i feel sure. Rated 4 out of 5 by PATinPNS from Quirky, Fun Game This is posted after playing the entire game. I thought for a few minutes into the game that Eipix had really lost it. Everything I saw I had seen before. Then it dawned on me, I played the beta testing. Yes, I am an idiot.. I enjoyed the beta test and was anticipating the release and wasn't disappointed. It is a fun little game. Graphics were well done as was the music. The voice overs were a bit over done, but acceptable. Effects went along with the action. Colors were bright and not drab as so many are here lately. So far as the level of challenge... apparently the mini games are simple and not too complicated, because I did most of them. If you are one who enjoys figuring out puzzles you might be a bit disappointed. Some I just could not figure out what to do, but those were few and far between. Hidden objects were varied and kept my interest. Only difficulty I had were those that open up in a window, generally during a hidden object scene, which were so small I couldn't see them and found the item either by chance or using the hint. You have an interactive map which, with all the back and forth, was very helpful. About the only complaint I have is when you come upon the Centurion, it is a repeated puzzle each time. It didn't make a lot of sense to do that, but I'm not the developer. The story did have some holes, but not so many that I got lost or didn't know what was going on. It had a beginning, middle and an end and if you don't try to read too much into it and go along with the intention of the story, it's fine. All in all this is a good game. I have most of this series and this would rate a little below the previous ones, but not by much. As always, give the demo a try. I think you will get involved with the game as I did and have a few hours of fun. Rated 3 out of 5 by Yanie1020 from Didn't Care for this One I rarely play an EIPIX game that I don't like, but this didn't do it for me. I really dislike the "amulets" where you search the screen for hidden symbols. That comes up a lot in this game. What's the fun in that? There's certainly no skill involved. As usual, the voiceovers are excellent, as with all EIPIX games. However, there wasn't much challenge to the game or the puzzles. I play using the custom mode, with very little help because I like a challenge. This was way too easy. Rated 3 out of 5 by Granny_Gruff from Another Battle Between Good and Evil Uncle dies halfway through writing a letter to you. You receive the completed letter after his death and find yourself in possession of his estate. You need to figure out what killed him, so investigation is in order. Apparently dear old Uncle had hold of an artifact that got him killed by a ghost. The artifact is supposed to go back to Ancient Roman times and was an attempt to contain a great evil. Anyone who touches the artifact will be targeted by a ghost. Uncle loved you enough to place you as the next victim. Good stuff: The bit of story you do get is clear. There are all the usual game elements, including a chain type Match 3 alternative to the varied multi-layered HOPs. Artwork is good, characterizations are fair, and the sound is appropriately rainy and thunderous. Bad stuff: You will be reminded of previous Myth series games with every strange step you take. As usual, no one thought through the story. Example: You wake in the middle of the night to find the house well engulfed in flames after being hit by lightning during a thunderous storm which did not wake you. You jump out of bed, and find yourself trapped by flames which have already collapsed part of the ceiling beams and engulfed the upper floor. Naturally you will stop to solve several puzzles and then run out into the still pouring rain to find one of uncle's friends fortuitously at the gate. True to the lack of thought currently in vogue among many Devs, you are still in your nightclothes and presumably barefoot. Hey gang, let's head out to the forest and explore some caves - especially the water-drenched one that uncle used to hide some of his treasures. Don't all antiquity collectors keep things in the worst possible conditions? Maybe Uncle left a couple of dresses with the antiques. There is also the time-wasting addition of a special charm/artifact, Valor's Light, which has a puzzle to use it to find hidden caches and another puzzle to use it for defense, not to mention the multiple steps/puzzles to get it charged. There's more, but I'll leave you to be aggravated on your own. Let's just say that once again, no one thought through the story from beginning to end. This is an OK game if you are looking for a time-filler for the weekend. Please try the Demo for yourself. I can't recommend a game I won't buy.